If you own a kitty, you've probably heard the warnings about the microbe toxoplasmosis and cats. Learn what every cat owner should know about this infectious parasite, and find out what you can do to minimize the spread to sensitive groups. Toxoplasmosis, Toxoplasma gondii, is a Protozoa that can be found living in virtually any warm-blooded mammal, but it affects some species more than others. The life cycle of this organism is rather curious. Cats appear to be the main host, providing the perfect environment where the parasites can reproduce. 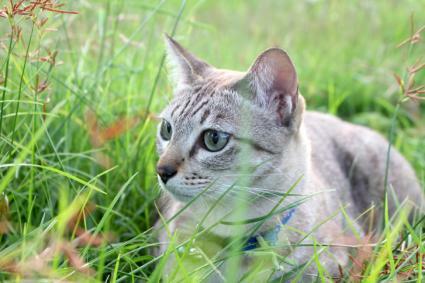 Felines pick up the organisms from eating infected birds, rodents and sometimes other cats' feces. The parasites then begin reproduction in the stomach, just like intestinal worms, and are finally shed in the feces. Eventually they will infect other mammals that come in contact with the infected droppings, and the life cycle begins again. Toxoplasma gondii is found all over the world, virtually anywhere cats live, and all cats are capable of becoming carriers. How Does It Affect Cats? Thankfully, other than using cats as a reproduction factory, the parasite does not appear to produce any ill effects, and a cat carrying the Protozoa will rarely show any symptoms. The news is not so good for other animals who manage to ingest it. For them, the organism attacks the internal organs, causing severe illness that sometimes leads to death. Toxoplasmosis does indeed infect people, and experts calculate as much as twenty-five percent of the world's population may be infected. Many healthy adults are able to fight off the infection without ever knowing they had it, while others will experience mild, flu-like symptoms. People with compromised immune systems are far more prone to experience the full effects of the toxoplasmosis infection as it attacks the lungs, heart and brains. The group at greatest risk from this parasite is the unborn. Although a pregnant woman may escape the worst of the symptoms caused by toxoplasmosis, the Protozoa passes through the placenta and attacks the developing infant's brain tissue. Additionally, pregnant women and anyone with immunodeficiencies should avoid litter boxes completely, and leave the cleaning job to someone else. If this isn't possible, they should always wear protective gloves when removing dirty litter and opt to use self-cleaning litter boxes to cut down on exposure. So, should you panic and drop the family feline off at the nearest animal shelter? Probably not. Practicing routine hygiene is usually enough to ward off an infection in most healthy individuals. However, anyone with a compromised immune system, such as a person infected with HIV or someone receiving chemotherapy, should take the possiblity of contracting toxoplasmosis seriously since it could have a devastating effect on their health. Anyone who falls in this category should discuss the situation with their physician and let that person help them make an informed decision.